Through the first two weeks of the fall athletic season, the North Marion football team has been the ultimate rhetorical question about the glass of water that is either half full or half empty. On the one hand, the Huskies' 18 points scored in its first two games of the season ranks below all but three teams at the 4A level. But on the other side of the ball, no other team in the state in the 4A, 5A and 6A classifications has given up fewer points —six total— than North Marion. Saturday's home opener against the Henley Hornets was the perfect microcosm to the first fortnight of the season, as North Marion's defense stood tall in a 6-0 shutout, lifting the Huskies to 2-0 on the year. "Hats off to our defense," North Marion head coach Keith Bennett said. "They were everywhere today. They stepped up to every single challenge in front of them today." Those challenges piled up throughout the course of the game in a rare Saturday afternoon contest. 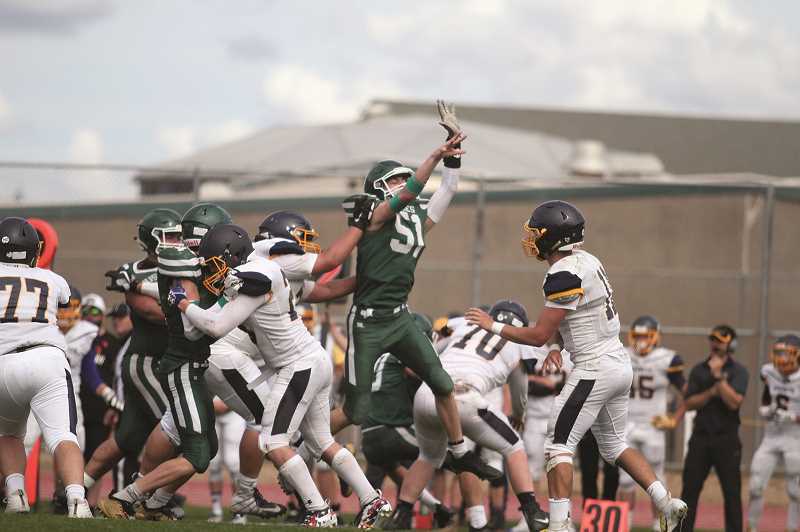 From the Hornets' swarming defense, a penalty-maligned offense and a number of starters sitting on the bench nursing injuries at the end of the game, the Huskies' defense was called upon to deliver a victory with no margin of room for error. "It was a true defensive battle," Bennett said. "It's good old-fashioned football. Credit to Henley's defense — they did the same thing ours did." The two teams combined for under 400 yards of total offense. North Marion scored its only touchdown of the game early in the first quarter, a 14-yard pass from Milo Bilyeu to Grant Henry, to put the team up 6-0 following a failed two-point conversion. It was the lone completed pass of the game for North Marion, which threw just six times total over the course of the contest. With an early lead and Bilyeu exiting the game in the first half due to injury, the Huskies eschewed the passing game in favor of grinding out the ball on the ground. It was the opposite case on the Hornets' side of the ball. North Marion suffocated Henley's running game, which gained just 37 yards, forcing the Hornets to go to the air to move the ball. While Henley had better luck gaining yardage through the passing game, it came at a cost. 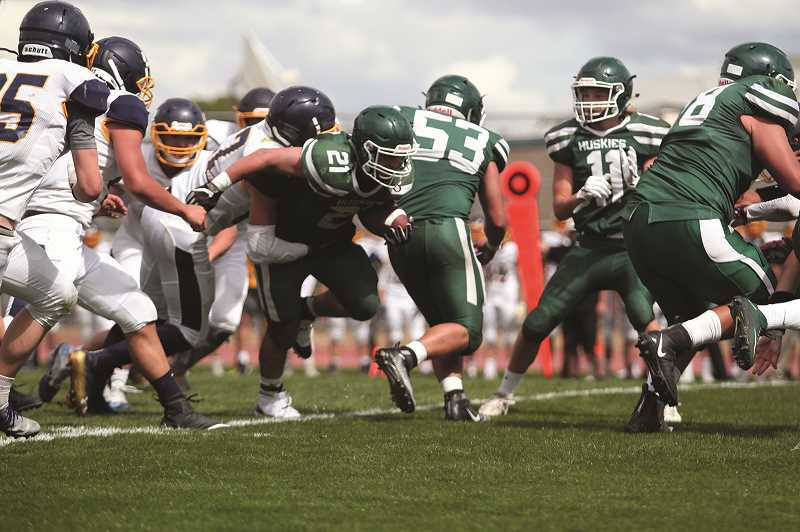 The Huskies' blitz-heavy packages penetrated the Henley offensive line, forcing the Hornets' quarterbacks to throw off-balance and into heavy coverage. The result was four interceptions — two each by Henry and Johnny Page — both of whom also were banged up when the final whistle was blown. Henry also added a fumble recovery to his stellar day on defense, giving the Huskies five takeaways on the day. "We're a little banged up today," Bennett said. "Henley is a hard-hitting football team and that showed. They're very well coached, a lot of big tough kids and they played one heck of a game. Hopefully everybody comes away healthy." 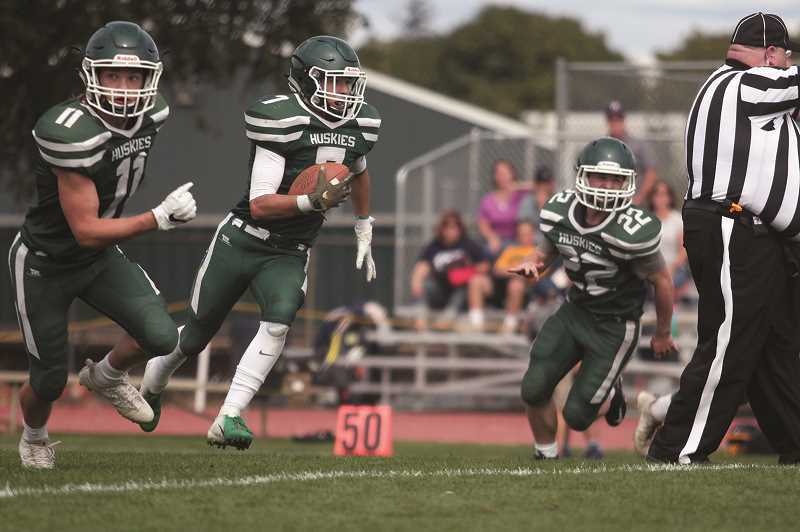 The biggest point of adversity for either teams' ability to move the ball consistently was the constant barrage of penalty flags — 14 for North Marion and 13 for Henley — most of which came against the offensive team. The Huskies drove several times deep into Hornet territory, only to see multiple penalties back the team up and ultimately cost them an opportunity to score. The most costly flag for North Marion came in the first half when Henry took a handoff up the middle and broke three tackles en route to a 67-yard touchdown run that was negated due to a block in the back. While Bennett wants to see the team reduce its early season penalty troubles, he doesn't want it to come at the cost of the energy and exhilaration that has thus far fueled the team's defensive success. "These kids are so anxious to play that it's kind of difficult to keep them contained," Bennett said. "It's a lot like a bull in a rodeo. It wants to come out, and that's how these kids are and that's how they play. Yes we want to fix the penalties, but we don't want to temper their excitement." North Marion running back Sam Garcia led all teams with 145 yards on 23 carries, accounting for nearly three-quarters of the Huskies' yards from scrimmage. Defensively, the Huskies limited the Hornets to just 158 total yards, including 37 rushing. It's the second week in a row North Marion has held an opponent under 200 yards of offense and under 40 rushing yards. North Marion has now gone seven full quarters without surrendering points, dating back to Stayton's first-quarter touchdown in the opening week of the season. North Marion (2-0) now turns its attention to the its final non-conference game of the season on Friday at home against the Cascade Cougars (0-2). The two former league rivals played against each other four times during the Huskies tenure in the Oregon West Conference from 2014-17. 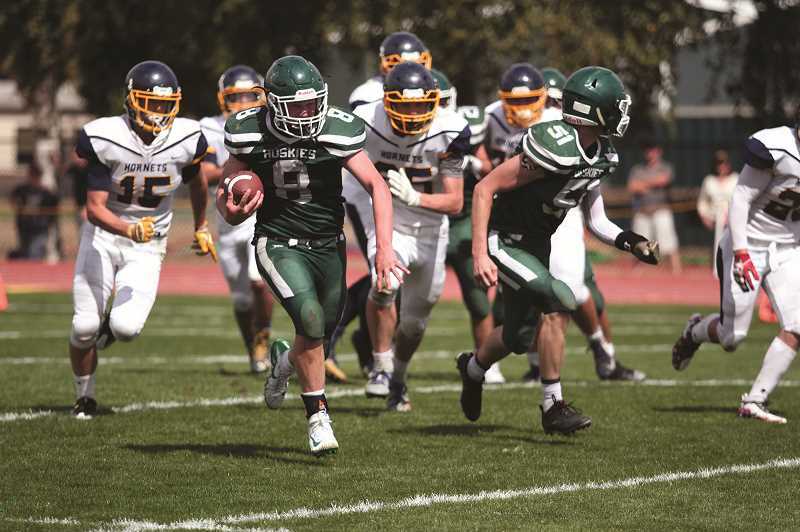 Cascade claimed the first three victories in the series, but the Huskies are coming off a 10-0 win last year to claim the league title over the Cougars. The game is also the first Friday night game of the season for North Marion, which has played on Thursday and Saturday, respectively, in each of its first two games of the season. The Huskies will be dedicating their new track and field facilities prior to the game, the first of many renovation projects slated to take place within the school district due to the recently passed school bond. Tail gating for the game begins at 6 p.m., followed by the ribbon cutting at 6:40 p.m. in front of the grand stands before the game kicks off at 7 p.m.
North Marion -- Milo Bilyeu 14-yard touchdown pass to Grant Henry (2-point no good).